Good afternoon all – or morning or evening, as the case may be – and welcome to the final installment in my Revelation Space review. Today, I shall be covering the third and final installment in the trilogy, otherwise known as Absolution Gap. As the conclusion to the series, it brought together the apocalyptic trends established by the first two and wrapped them up pretty nicely, while also introducing some ideas and threads of its own. These included the threat of the Inhibitors, the attempts by Neville Clavain and his rogue group of Conjoiners, Hyperpigs and refugees to stop them, and the growing awareness of those within the universe at large of their approaching doom. And, true to form, Reynold’s also tells the story through multiple threads which seem unrelated at the beginning, but ultimately come together to reveal a single plot arc that brings everyone and everything together. And last, but not least, this book also brought the series full circle in terms of the quasi-religious motifs that play an important role in the story. As I mentioned in a previous post, concerning sci-fi and religion, Alastair Reynolds was not one to shy away from the subject of spirituality and religion. One look at the titles in this series (Revelation Space, Redemption Ark, Absolution Gap) are proof enough of that. However, Reynolds went a step beyond, weaving a narrative which begins with knowledge, proceeds to contrition, and then culminates in a sort of forgiveness for all humanity. In the end, the acts of the few who would risk all to save others provides the whole with a sort of reprieve, a second chance for them to contemplate their ambiguous future. The story opens in 2615, with aboard a lighthugger known as the Gnostic Ascension, a freelance treasure-hunter which is run by a sado-masochist named Jasmina. After waking her crewman Quaiche from reefersleep, she informs him that his attempts to lead them to valuable artifacts have failed for the last time. In order to ensure his success during their next stop, a planet in orbit of 107 Piscium, she places his lover Morwenna (an Ultra and fellow crewmember) in a scrimshaw suit on the outside of his exploratory ship until he returns with some goods. In the second thread, events take place on Ararat in 2675, twenty three since the crew of the Nostalgia for Infinity landed on the planet. After receiving a capsule from space, Scorpio seeks out Clavain, who has withdrawn from society and left him in charge. This was apparently due to the death of his daughter Felka, who wandered into the sea to contact the Pattern Jugglers and never returned. They discover that the capsule is from Ana Khouri, whom they have not seen since events around Resurgam took place. Ana informs them that they are fighting the Inhibitors using advanced tech that they have retrieved with the help of Ana’s daughter, Aura. Having come into contact with the Hades Matrix, the alien moon which was an actual data storage device, she now has visions and is able to convey alien technology to their forces which they have begun to incorporate. Unfortunately, Skade has returned from where they had left her last time and kidnapped Auna from Ana’s womb, and is now holding her hostage. After being attacked by Inhibitors, her ship crashed on Ararat. Making their way to the ship, Skade demands that they kill Clavain in exchange for Auna. Clavain agrees and asks Scorpio to do it for him, since he trusts him as a comrade as arms. He also asks that his body be thrown into the ocean so it might join with Felka and Galiana, his daughter and wife. After killing Clavain and rescuing Auna, the ship is attacked by Inhibitors, but they are saved by the Conjoiner Remontoire who defends them from orbit. Back at the colony, the leaders decide that its time to load up the Nostalgia and leave the planet and confer with Captain Brannigan (now part of his ship) who reveals that he has been preparing to do so for some time. Apparently, he has been aware of what’s been going on in space, the mounting fight between Inhibitors and their allies, and knew the day would come when he had to lift them off Ararat. Bringing what colonists they can with them, they break for orbit and are met by Remontoire who helps outfit them with their new weapons. After debating their ultimate destination, they decide to go to Yellowstone to help evacuate the people there before the Inhibitors lay it to waste. Aura tells them to go to a moon called Hela, though they don’t understand why and choose to ignore her advice. When they arrive at Yellowstone, they find the planet overrun and few, if any, ship attempting to depart the system are uninfested by Inhibitor machinery. As a result, Scorpio’s leadership is challenged and a new council is formed, which elects to go to Hela as Aura suggested. In the third and final thread, the place is Hela and the year is 2727. On this world, a young 17 year old named Rahsmika Els runs away from home to find her long lost brother Harbin, who joined the “Cathedrals” long ago. This is basically a mobile city made up of religious institutions that travel the planet, keeping its eyes on the sky so they may witness what their leader – Quaiche – witnessed many years ago. 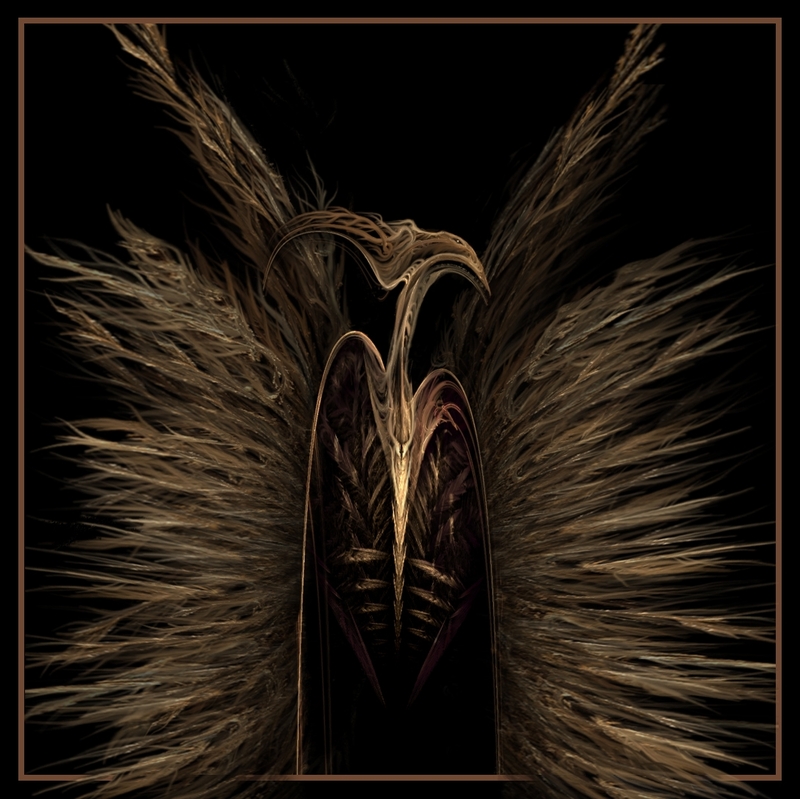 The disappearance of Haldora, which is the basis of their faith, is something they are waiting on, and all initiates are injected with Quaichist blood to receive the same virus that converted him. When Quaiche becomes aware of her, he becomes very interested. Els apparently has the ability to discern lies from truth. What’s more, her principle interest lies in xenoarchaelogy, and her theories on the extinct insectoids which were indigenous to the planet (the Scuttlers) are quite fascinating. Apparently, this race was also wiped out by the Inhibitors, and their whereabouts are another subject of fascination for the cult that has grown up around Quaiche. Because of all this, he lures her to his Cathedral and takes her on as an apprentice, never revealing that her brother is in fact dead. Meanwhile, Els becomes plagued by nightmares about a race known as the “Shadows”, a people that live in a brane (dimension or universe) parallel to our own. In the course of speaking to them through her dreams, she learns that their universe was consumed by a rogue terraforming agent and they are trying to pass through into our own. Eons back, they had showed the Scuttlers how to build a machine that could bring them across, which was apparently hidden inside Haldora. Hence, the gas giant is not a natural planet, but a giant cloaking field which sometimes malfunctions. Hence its disappearance from time to time. Shortly thereafter, the Nostalgia shows up and begins entering into negotiations with Quaiche to protect the planet. While this is happening, he attempts to seize the ship, but Scorpio and his people defeat them. He then takes Khouri and Els hostage, who we now learn is actually Aura (now 17 years old). Her identity was a cover to infiltrate the planet and learn all she could about their society, and her gifts the result of her enhanced mind. Quaiche then reveals that he wants the Nostalgia to anchor itself to Hela and stop it from rotating, so that he may watch Haldora permanently. Brannigan agrees and lands the ship, but also deploys a Cache Weapon which fires on Haldora, destroying its cloaking field and revealing the machine within. A fight ensues, in which Quaiche is killed and Nostalgia/Brannigan is destroyed. Aura and Khouri are rescued and reunited with the crew. However, the question remains of what to do about the Shadows. When a digital envoy enters into a scrimshaw suit and begins to speak to them, it claims the offer to destroy the Inhibitors is still open. However, Scorpio claims that their is a better way. He claims that materials found on Ararat match ones found on Hela, which they originally took to be massive seashell deposits, but which turned out to be advanced building materials. In the epilogue, the year is 3125 and the place is a Pattern Juggler planet. This brings the story full circle, back to the beginning where this same woman was standing on the world right before it was to be evacuated. She reflect on everything that has happened and realizes Scorpio was right. After finding the Nestbuilders, which had been hiding between stars, they used their weaponry and eventually pushed the Inhibitor menace back. The war is still not over, but victory seems assured. However, in doing so, they created a greater problem: the so called “Greenfly” machines. These are a self-replicating race of terraformers that programmed to destroy every object in a solar system and reorganize them into trillions of vegetation-filled habitats. I should start this last section by stating that this was my least favorite book of the three. This does not mean I didn’t enjoy it, but as usual, there were the elements I had come to know and expect from Reynolds which detracted from the overall story. These include his use of convoluted plots, multiple twists, and some rather weird and out there concepts. For starters, Clavain and Skade are both killed off pretty quickly in the beginning in a way that suggests that they were simply being done away with. In reality, Skade’s involvement in the story pretty much ended in book II when her ship blew up. Bringing her back and having her take Clavain with her just seemed like a way to write Clavain out, which I really didn’t see the need for (aside from making him a Jesus-like figure). Also, the concept of Ana’s daughter, which is the source of their ideas for fighting the Inhibitors, also seemed a bit weird. I mean a psychic, talking baby? The Hades Matrix being a source of valuable information I could see, but why not just have it that they went back there to get as much information as they could in the intervening 23 years? And if they were going for a messiah-type figure in her daughter, why not let her grow up before she becomes this impressive psychic figure. It would go a long way to furthering the Judea-Christian elements that are prevalent in the story. Which brings me to the next issue, that of the many plot twists. For starters, why was it necessary to blank out Aura’s mind so she could pretend to be a 17 year old native to Hela? Why not just send her in as is, posing as a religious convert who had come from off world? All kinds of people came to Hela everyday for this exact reason, so why not simply slip her in with them? Or, why didn’t they simply contact Quaiche directly when they got there instead of going through all this cloak and dagger? Things really didn’t materialize until they did anyway, so why go through all that? Granted, it tied the threads together quite succinctly, but by the time it is revealed, I began to feel that the story was trying to do too much. And finally, there is the matter of the twist ending. At the time of reading, I felt like it came out of nowhere. Who were these Nestbuilders? Why hadn’t we heard of them until now? And why the last minute introduction of them? Naturally, I would later learn that the Nestbuilders did not so much come out of nowhere, but were instead an adaptation of something from an earlier work. Essentially, they are a species who make an appearance in “Galactic North” and who are related to the “Slugs” from Chasm City – i.e. the species that had taken to hiding between star systems to avoid the Inhibitors. This made sense and wrapped things up nicely by tying it back to his previous work. But much like with the character of H in the Redemption, I felt that things had not been explained fully. What’s more, this does not explain how Scorpio was able to discern their existence and learn all he needed to know – like the fact that they could trust them or they would be able to help them beat the Inhibitors – from one tiny shard of shell they left behind. Perhaps if he revealed that Felka told them as much after meeting with the Pattern Jugglers one last time, or that Galiana had conveyed some hints in one of her visions before dying. But as I recall, no explanations were made and we’re simply handed this solution shortly before the book ends. Again, not well explained, and kind of comes off as a third act twist that feels contrived. And now for the things I liked! As usual, Reynold’s characteristic knack for combining cool technology, hard science, a gritty take on the universe, and some interesting conceptualizations of alien civilizations proved very interesting. On top of all that, there was a rather intriguing commentary on organized religion and apocalypticism which ran through the entire story, which achieved a truly artistic climax in the way he envisioned the “Cathedrals”. I am forced to wonder if he adapted that from somewhere, or it was a Reynold’s original. Either way, very cool! And in hindsight, I actually appreciate the way he managed to weave elements from Chasm City and Galactic North into this story. The way it ended on a note of uncertainty, due to the fact that their universe was beginning to resemble the very one the Shadows had told them about, really brought the story home and gave the impression of a tightly knit universe. Lastly, the way Reynolds took this opportunity (again) to get into some hard scientific concepts, most notably membrane theory (aka. M-theory), was quite welcome. Much like how he incorporating Galactic Collisions in volume two, it was not only educational but enjoyable to see real scientific theories being adapted into fiction. All in all, I consider the Revelation Space trilogy to be one of the most influential and poignant series I have ever read. While it might not rank up there with Dune or LOTR, it remains a source of inspiration and ideas for me. Hell, Reynolds practically taught me all I know about nanotechnology, not to mention time dilation and relativistic space travel. Without his hard scientific influence, I would still be believing in a universe where FTL had to happen in order for good sci-fi to occur! 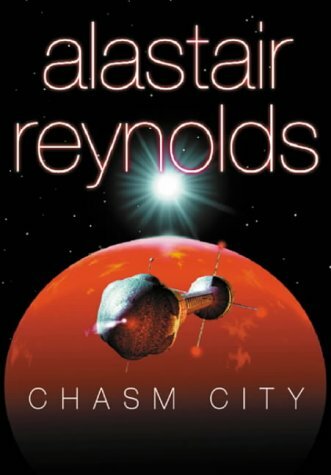 Next up in my review of Alastair Reynold’s Revelation Space universe is the prequel novel and setting piece known as Chasm City! Released in 2001, one year after Revelation Space and a year before Redemption Ark (I know, prolific, aint he? ), the story takes place outside of the main trilogy, but details the setting and some of the characters who will play an important role in it. As the name would suggest, the setting of this novel is the all-important location known as Chasm City itself. In Revelation Space, we got treated to an earful about this place since it is the undisputed hub of the known universe. Or at least it was before the Melding Plague, a terrible nanotechnological virus, turned the place into a twisted, gothic nightmare. According to Reynold’s many descriptions of the place throughout the series, Chasm City was not only the capitol of Yellowstone (chief planet of the Epsilon Eridani system), it was also the center of the universe when it came to commerce, innovation and technological progress. It’s multi-tiered cities, contained within the “Mosquito Net” (i.e. habitation dome) were a marvel of nanotechnological achievement, living buildings that were capable of maintaining themselves. 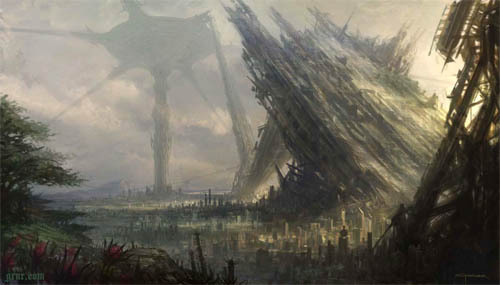 The name itself referred to the fact that the city itself was built in a chasm which was open to the planet’s interior. From this chasm, large clouds of gas would erupt periodically, which the inhabitants used to fashion an atmosphere. In orbit, a huge array of satellites and orbital platforms had been installed, known as the “Glitter Band” due to their unrivaled beauty and the fact the wealthiest citizens maintained opulent homes in orbit. 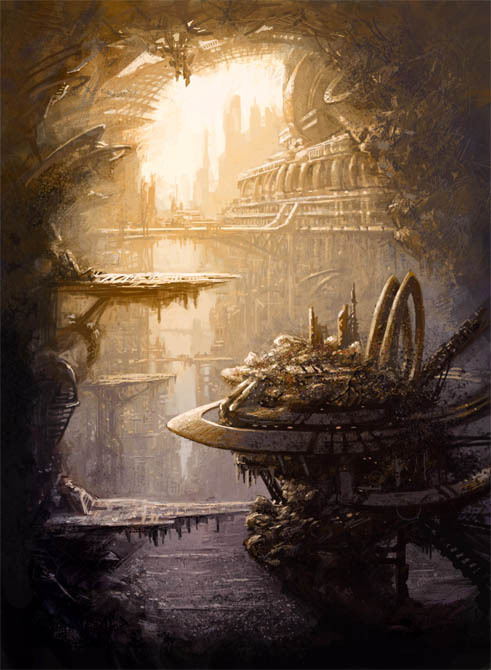 And last, but not least, Chasm City was the home of the human faction known as the “Demarchists”, a name which is an amalgam of Democratic and Anarchy. These people were the most advanced factions in the universe, save for perhaps the Conjoiners, who used implant technology and wireless communications to create a society that needed no official offices or institutions. All decision making processes were run by direct democracy and the law maintained by police who enforced the public will. Sure, there were still offices and ranks, but the general trend was towards de-structurizing and an avoidance of hierarchy. 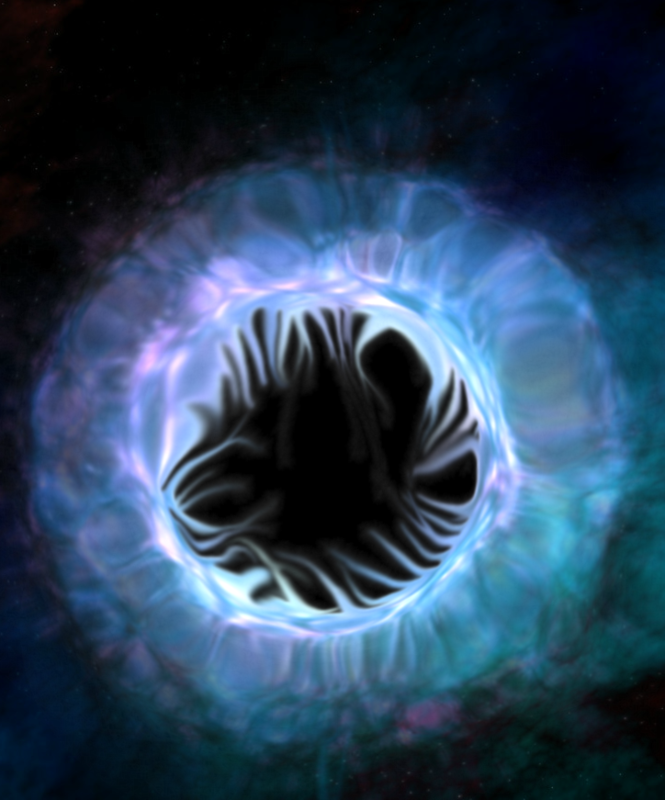 The first thread story opens on the planet known as Sky’s Edge, a planet in orbit of 61 Cygni A, where an enforcer named Tanner Mirabel is looking for a post-mortal noble named Argent Reivich. This man, we quickly learn, was responsible for the death of the wife of Tanner’s employer and is fleeing the planet for Yellowstone. Tanner and his friend pursue him, a chase which takes them into the depths of Chasm City and provides a first-hand look at the effects the Melding Plague has had and the illicit activities that have taken over the now fallen city. In addition, two more threads open through a series of flashbacks and dream sequences. It is established early on that Tanner has been infected by an “indoctrination virus” – a sort of bio-engineered program which forces those who have it to experience religious visions. He interprets the dreams he has as a symptom, which are predictably concerned with the life of Sky Haussmann, the oft-revered and hated man who founded the colony of Sky’s Edge. This constitutes thread two of the story, where Tanner dreams of Sky’s childhood aboard the Flotilla that traveled to Sky’s Edge from Earth many centuries in the past, aboard generational ships where he was amongst the waking crew. In the third thread, Tanner relives the traumatic events that led him to Yellowstone in pursuit of Reivich. Apparently, Tanner worked for a man named Cahuella, an arms dealer who is being pursued by Reivich because he sold arms to a rival family which used them to kill his parents. We also learn that Tanner loved Cahuella’s wife, a woman named Gritta. According to the flashbacks he experiences, it was while deploying to the jungles of Sky’s Edge, in an attempt to intercept Reivich, that the incident that led to Gitta’s death took place. Upon reaching Chasm City, Tanner sees first hand what has become of the city. A once technological marvel, it has now degenerated into a dark and ugly, the buildings appearing as twisted, diseased trees. The Glitter Band has fallen into disrepair, and is now known as the “Rust Belt”. There is also a lucrative trade in what is referred to as “Dream Fuel”, which appears to render users temporarily immune to the Melding Plague. And last, there is the “Game” which Tanner becomes trapped in, where residents of the Canopy (those few still-privileged people who live close to the Mosquito Net) hunt people who live down in “The Mulch” (aka. down below). After escaping the “gamers”, Tanner takes a female resident of the Canopy hostage and learns that she is part of the lucrative “Dream Fuel” trade. With her help, they travel deep into Yellowstone’s underground network and tunnels and find the source of it, which appears to be a giant, sentient slug. This begins to line up with some of the vision’s Tanner has been having involving Sky and the Flotilla, which continue to haunt his dreams. Basically, Tanner is now aware that Sky took over control of the Flotilla after his father was murdered by an embedded agent. In a twist, Sky allowed this to happen because he was outraged to learn that his parents had taken him from another family that had died while in cryosleep. While in command of the fleet, he learned that they were being pursued by a strange, phantom ship. When they investigated, they discovered that it was an alien vessel that had morphed to look like one of their own. Inside – drumroll please – was a giant slug living in a big pool of Dream Fuel! Yes, it seems that the fuel is in fact the organic secretions of the Slug, and that they are a sentient race that has been living in hiding ever since the emergence of a terrible alien threat that has been destroying all space-faring life. For those who have read Revelation Space at this point, it is clear the slug is referring to the Inhibitors. Hence why the Slug ship was following the Flotilla, it had hoped to remain inconspicuous by mimicking other species and their ships. The one currently being used to provide Dream Fuel is another, one which chose to hide deep within Yellowstone to avoid detection. At the same time, Tanner becomes aware of one horrid fact. After remembering everything from the night where Gitta died, Tanner comes to the realization that it was he that killed her. In the course of their advance through the jungle to intercept Reivich, he and his men ambushed their camp and took Gitta hostage. Rather than let them get away, Tanner opened fire and accidentally killed her. However, he is confused because his memories end with Cahuella taking his own revenge by feeding Tanner to one of his giant snakes. Nevertheless, Tanner gets back on Reivich’s trail and finally corners him in orbit. There, he finds the ruined body of Reivich who has been hooked up to a machine that was supposed to recor*d his consciousness and create an “alpha” (i.e. a living computer construct) of him. However, the process was rushed, and now Reivich’s body has been irreparably damaged. Close to death, he reveals another twist. It seems that he is not Tanner after all, but Cahuella himself! Small hints are given throughout the novel tot his effect, but he realizes that it is true when Tanner himself walks in! Yes, it seems that Cahuella couldn’t deal with the anguish of losing his wife and decided to switch memories and appearances with Tanner while he was busy torturing him. However, Tanner managed to escape after Cahuella left and made his way to Yellowstone to get some payback of his own. The two fight, but eventually Cahuella realizes his body contains all kinds of enhancements, such as poisonous snakes’ teeth, which he used to overpower Tanner. Reivich dies too, and Cahuella is left with his many painful revelations. Another painful revelation is the fact that the dreams he’s having or not the result of the indoctrination virus, but his own memories coming to the surface. It seems that he, Caheulla, is in fact Sky Haussmann himself, and that after sacrificing several innocent lives to get his own ship to 61 Cygni A ahead of the rest of the Flotilla. Because of this, the world was named Sky’s Edge, a sly reference (and criticism) of all he did to make it there first. After he set down, he was set upon by other groups of colonists who wanted him brought to justice. Contrary to popular belief, he wasn’t crucified publicly, but substituted himself with a look0alike and then slipped into the jungle to live out his life in a new persona (Cahuella). Seeking redemption now, he returns to Chasm City and teams up with his lady friend in the hopes of making some changes. For one, the Dream Fuel trade is to be regulated and humane now, no more torturous extraction from the poor Slug. Second, the “Game” is reformed so that the hunt is for volunteers only, with plenty of rules and chances for the “hunted” to save themselves after they are caught. With all this in place, Tanner Mirabel, aka. Caheulla, aka. Sky Haussmann, settles in for a life he can live with and says goodbye to a life of revenge and running. To begin with the good points, this book was once again an intriguing and exciting romp through the Revelation Space universe. After that first installment, this book cashed in on all the buzz and interest he had created for his fictitious backdrops, such as Sky’s Edge and Chasm City, both very interesting place in their own right. It also detailed a number of elements that were brought up but not developed too much in the first novel, such as the game “Shadowplay”, which Ana Khouri was a member of. At the same time, it also discussed and delved into the dynamics of life and the wars on Sky’s Edge, which also came up in relation to Khouri’s character. And of course, there was plenty more of the same interesting stuff that set’s Reynold’s universe apart. The concept of time dilation, post-mortality, alpha-level simulations, the Inhibitors, the Melding Plague, nanotechnology, cybernetic implants, and the “indoctrination virus”. All of these elements were brought up in Revelation Space or the subsequent novels to one degree or another, and it was good that Reynold’s side-stepped the trilogy in order to provide some more deep background and development for these concepts. But above all, the primary focus of the novel, which was on Chasm City itself, was indispensable to this series. A once powerhouse of technology and civility, the Gothic, steampunk-themed environment is just so interesting and rich that it really had to have it’s own book. After reading about it in the first novel and seeing subsequent references to it later in the series, I just knew that Reynold’s would have to come back to it at some point. There was simply too much there for it to a passing mention, not to mention too much in the way of implied significance. In addition to being an richly detailed environment that inspires so much mental imagery, Chasm City is a fitting metaphor for how technological progress can so easily go from being the stuff of dreams to the stuff of nightmares. It only makes sense that the urban center where all the greatest technological leaps of the future were developed – brain implants, man-machine interface, alpha-level constructs, clinical immortality, nanotech, biotech – that it is also be the place where it all came crashing down. And what did it was especially appropriate – a nano-virus which hit them where they were most vulnerable by perverting the very technology they were so dependent on. As for the weaknesses, well, they are something that comes up a lot in Reynold’s works. For one, there are too many twists! Why, for example, was it necessary for Cahuella to take on Tanner Mirabel’s identity? Wasn’t it enough that the man who failed to save the woman he loved, who also had a bit of an elicit thing going with her, was out for revenge? And why for that matter did he also need to be Sky Haussmann. One hidden identity was enough, and given its importance to the storyline, it would have been enough for him to be Sky. Think about it, the reviled and worshiped founded of the colony runs into the jungle and takes on the identity of a simple bounty hunter. Wouldn’t that have been better than assuming the identity of a high-profile arms dealer? And since he settled down to become a professional hunter in Chasm City anyway, wouldn’t him being Tanner all along provide more symmetry? And to explain the whole memory wipe thing, just say that he assumed the identity of Tanner completely to avoid any slip ups, or because he genuinely wanted a new lease on life. Playing it the other way was just plain weird. Also, there are some other odd elements in the book, stuff that seemed less creative and more far-fetched than his usual story elements. For example, we see that in Chasm City, people rely on more than just “Dream Fuel” to protect themselves from the Melding Plague and prolong their lives now that they can no longer depend on nanotechnology. One of them is a genetic enhancement using Koi fish DNA. Seeing as how the Koi is quasi-immortal and will continue to grow so long as they have new environments to grow into, the residents of Chasm City decided to harness their genetic material in order to prolong their lives indefinitely. In fact, Tanner/Cahuella/Sky is shown to a sort of shrine in one of the city’s thoroughfares where a massive, centuries-old Koi is being kept in a tank and revered. And it struck me as just plain strange. Sure, this scene provides a sort of commentary on the vagaries of clinical immortality, but it still felt oddly out of place. So, for that matter, did the descriptions of the various people of the city who have used genetic enhancements to elongate their faces and skulls in unnatural shapes, as well as grow wings and other appendages. I get that in this universe, people can do some rather odd things with their biology, but why the hell would they want to? Much like hypercats, superchimps, the winged unicorns and other such creations from the series, it felt like Reynold’s is getting off-kilter and being weird for the sake of weird. But other than that, the book is a worthy read and kind of required if you want to be able to make sense of the series. Like I said before, there were aspects of Redemption Ark that I didn’t get until well after I read this book, and since it’s placement in the series comes before the other books, it behooves the reader to tackle this one before moving on to the later books in the series. Coming up next, Absolution Gap and the conclusion to Alastair Reynold’s lineup! 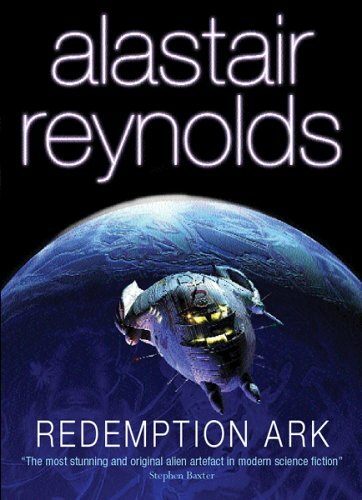 Continuing with the Alastair Reynold’s series is the second book in the Revelation Space universe, otherwise known as Redemption Ark. Released in 2002, just two years after the debut novel in the series, this book picked up where the previous story left off, continuing the story of the known universe, the Inhibitors, and the coming crisis where they would attempt to wipe out humanity. While this alone was certainly a basis for an exciting novel, this second installment also included a lot of additional elements, such as a protracted war between the Demarchists and the Conjoiners, the inner workings of these and other factions, what life is like in the “Rust Belt” – the ring of satellites and orbital stations around Yellowstone – and some added secrets and twists that make it all more interesting. Out of the three books that make up this trilogy – Revelation Space, Redemption Ark, and Absolution Gap – this one is definitely my favorite. While it was certainly no less interesting and detailed than the first, it was far less convoluted in terms of plot and expanded on some key elements. And ultimately, I found it more entertaining in terms of its pacing and action, and its characters were indeed more relatable than in the first. The story opens in 2605 with a major discovery being made. After generations of being unheard from, Galiana (the woman who founded the Conjoiners) returns from deep space. Her vessel was apparently set upon by a mysterious force, square-sized segments of the ship are missing, and all aboard appear to be dead. All save for Galiana herself who is in cryosleep and appears to be suffering from the intrusion of an alien mind. After investigating the ship, Skade, a special operative for the Conjoiner faction, contact is made with Galiana herself. It is then revealed that the alien force which attacked their ship, and now controls Galiana herself, was none other than the Inhibitors. They now are able to speak through her, and Galiana asks to be killed. Skade however puts her in suspended animation in the hopes that she can he helped, and so they can get more information out of the Inhibitor influence later… Skade herself appears to be communing with hidden voices, which belong to the Night Council, a super secret organization within the Conjoiner leadership that runs spec ops. Fast forward to ten years later around Yellowstone, where a war is taking place between the Conjoiner faction and the Demarchists. After many generations of cooperation to restore Chasm City from the terrible effects of the Melding Plague, tensions have reached a crisis point and a constant state of war has been in effect ever since. Here we see Neville Clavain, a high-ranking military officer who defected to the Conjoiners centuries back. In the course of a battle, Clavain comes into contact with a Yellowstone cosmonaut named Antoinette Bax, who nearly loses her ship while attempting to bury her father in the system’s gas giant, Tangerine Dream. After saving her ship, Clavain lets her know that if he sees her again, she’s dead, thus establishing that they most surely will! After taking down the Demarchist ship, he also finds a Hyperpig (a race of human-pig hybrids) who was apparently their prisoner. He also meets with Felka, Galiana’s gifted daughter whom he believes might be his as well. Clavain is then brought to the Mother’s Nest, the Conjoiner hive, where he is asked to join the Conjoiners leadership, a decision he has been resisting until now. Skade informs him about the Inhibitors, and how there presence necessitates that they undertake a mission to reclaim the lost Conjoiner doomsday weapons. These weapons just happen to be the ones that appeared in the first novel, which are the current property of Volyova and the Nostalgia for Infinity. The first step in the mission involves taking Clavain to see the fleet of advanced starships that the Conjoiners have been building in secret. Skade claims that the weapons and ships will be used to defend humanity against the Inhibitors, but Clavain is convinced that they will actually be used simply to evacuate the Conjoiners and abandon the rest of humanity. She confirms this when he begins a daring escape, saying only that “It’s a Darwinian universe, Clavain.” Clavain then travels to Yellowstone to defects to the Demarchists and spread the news of the Inhibitors, enlisting Antoinette Bax’s help to escape the pursuing Conjoiners under Skade. Told ya they’d see each other again! Remontoire, a member of the Conjoiner leadership and old friend of Clavain’s pursues him to Yellowstone with Scorpio. However, once they reach Yellowstone, they are captured, along with Clavain and Antoinette, by a mysterious figure known as “H”. He takes them into his compound, which happens to the be the Mademoiselle old hangout, and tells them the truth of their situation. 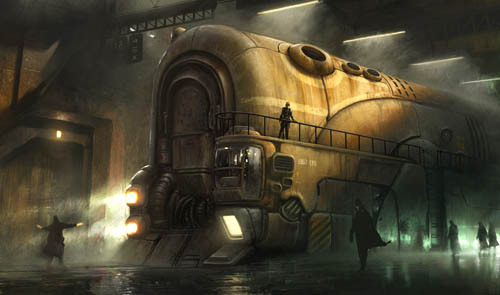 H reveals that many years previous, Skade participated in a raid into Chasm City to capture secrets that would lead to the development of inertia suppression technology. He believes that at that time, she was subverted by the Mademoiselle herself, who happens to be the voice that’s inside her head. Clavain reveals Skade’s plans for the Conjoiner fleet and the cache weapons, and H agrees to help him beat Skade to them. H supplies ships and his own version of the inertial suppression technology, while Scorpio supplies an army of hyper-pigs for the pursuit. They name the ship the Zodiacal Light, in honor of a ship that holds significance to Scorpio. Meanwhile, on Resurgam in 2665, Ilya Volyova and Ana Khouri have adopted aliases and are working on the planet. 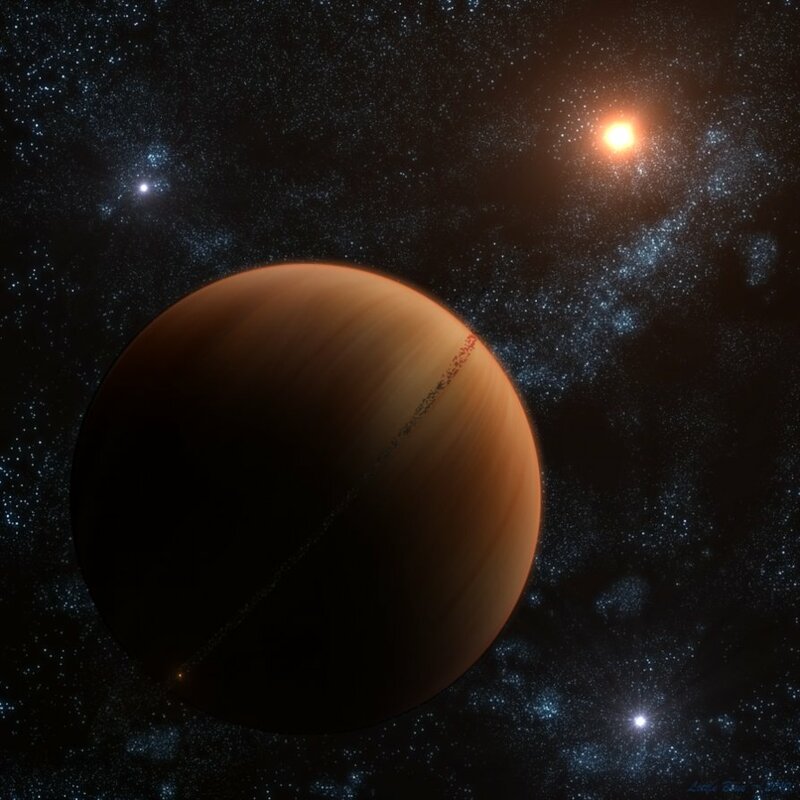 They have learned the Inhibitors have arrived and are busy dismantling several rocky moons and are moving the components towards the system’s gas giant, Roc. 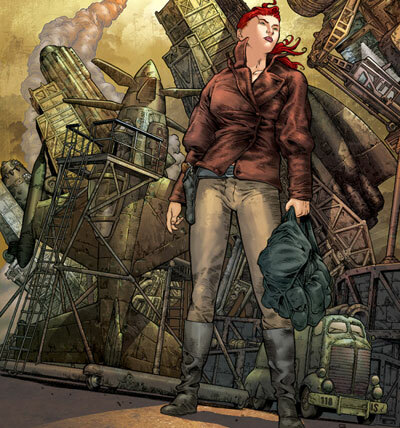 They begin collaborating with the local resistance leader, Thorn, who has been attempting to evacuate the planet by communicating with the Nostalgia, which is now under Captain Brannigan’s direct control. Thanks to the Melding Plague, he has now merged with the ship. They begin the evacuation while the Inhibitors continue building their mysterious weapon, which appears to be a large gravitational device which they use to sheer the system’s sun to pieces. Unfortunately, their limited resources are only moving a few thousand people at a time. Volyova decides to deploy the Nostalgia’s cache weapons against the Inhibitor’s weapon to buy more time. However, her efforts are upset a little when the Captain, in control of the ship and the weapons, attempts to use one to “commit suicide” by blowing the Nostalgia apart. Overwrought by guilt over everything he’s done to survive, he tries to end it all, but Volyova’s quick intervention stops him. By positioning her shuttle between the Nostalgia and the cache weapon, her shuttle is sliced in half and she is nearly killed. However, she is successful in getting the Captain to stop and he agrees to abide by her decisions. Skade and Clavain then race to the Resurgam system employing various creative long-distance strategies against each other and pushing their vessels to higher and higher speeds. 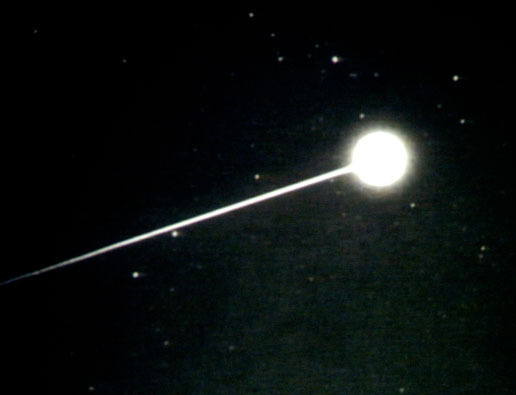 Eventually, Skade’s vessel is damaged in an attempt to exceed the speed of light. Clavain and crew arrive in the Zodiacal Light ready to recover the cache weapons. 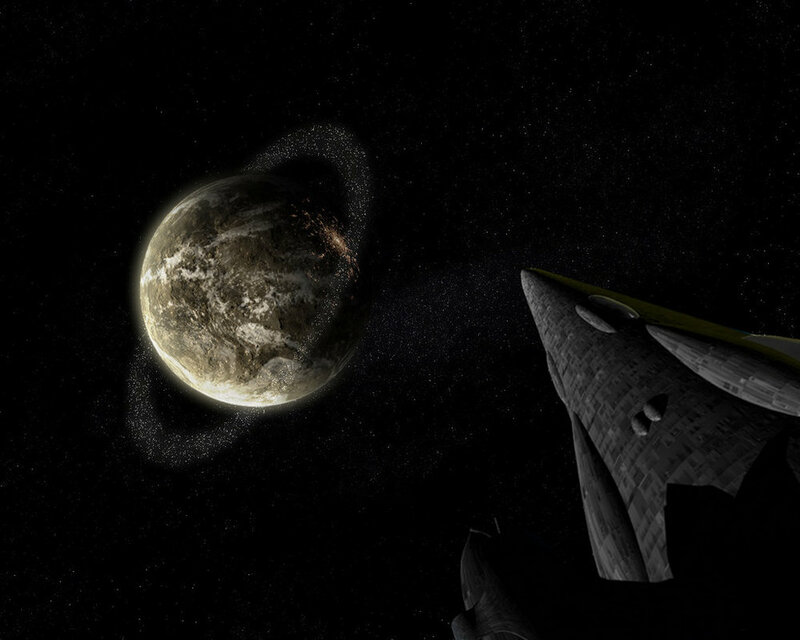 They begin communicating with the Nostalgia via a beta-level simulation of Clavain, but the efforts prove futile. Volyova refuses to hand them over and Clavain and friends are not willing to leave without them. A shooting fight begins between the two sides when both ships come together. Clavain’s superior forces capture Nostalgia for Infinity, although Volyova is able to damage Zodiacal Light with one of the cache weapons. At a bit of a stalemate, Negotiations resume and the two sides come to terms. The evacuation is completed with the help of Clavain’s forces and the Nostalgia while Volyova, who is dying of her injuries, takes half of the cache weapons and attacks the Inhibitors in the Storm Bird, to no effect. Remontoire and Khouri remain in the system in the Zodiacal Light to try and contact Dan Sylveste in the Hades Matrix in hope that he will be able to supply information that can be used to fight the Inhibitors. The Nostalgia then crosses paths with Skade’s ship again, which they rig to explode. But before this happens, Skade reveals the true plan and how they knew about the Inhibitors in advance. It seems that the Conjoiners began a project many centuries back known as Exordium, which involved the use of quantum computers to communicate across time and universes. This led them to the creation of the Conjoiner drives, but also to the Inhibitors impending attack. As a result, they began developing the cache weapons for the day when they showed up, but knew that even these wouldn’t be enough. This prompted them to develop the special fleet to escape to deep space. In the end, Clavain and his team are unable to convince Skade that she’s being manipulated and learn that Galiana’s body is on Skade’s ship. But since she wants to die, he decides to detonate it once they are at a safe distance. Clavain mourns her death, since they were lovers, and the ship finds its way to a Pattern Juggler planet where they set down and begin building a tentative colony. Things seem bleak, until Felka reveals that she’s seen the planet before. Before dying, her mother showed her things, which included a vision of this place. She knows then that they are exactly where they need to be and takes heart from that. From this planet, they await the arrival of Khouri, Remontoire and the Zodiacal Light to catch up so they can continue the fight against the Inhibitors. Like I said before, this book had a lot going for it that was new and interesting. One of the most important was the asides made by the Inhibitors themselves, which revealed their deeper intentions. Not only are they trying to inhibit the growth of space faring intelligence to prevent another Dawn War, but the inevitability of Andromeda’s Galactic Collision with the Milky Way is another reason. When this happens, the disturbance will cause untold destruction, especially to any civilizations inhabiting either galaxy. The only way to prevent trillions of deaths is to ensure that either no space-faring species are around at the time, or that one super-advanced one was in place to control the entire galaxy. Since the latter is so unlikely, they chose to opt for the former. Also, the war between the Conjoiners and the Demarchists was an interesting touch. It provided some added excitement to the early chapters and some intrigue to the evolving story. Not that much was needed, given the plot involving the Inhibitors and the mounting crisis with them. Still, it was a nice addition. The glimpse inside Conjoiner society and the way they brought back characters from the earlier short stories, crossing them with this main plot line, also provided a lot of meat and consistency to the larger universe. And last, there is the consistent theme of this novel. Whereas the first focused on revelation, this one was all about redemption. It was a fitting theme for the second book after everything that had taken place in the first. The misdeeds of Sylveste in his long search for answers, the crimes of Captain Brannigan in his quest for immortality, and even of Volyova in her drive to see his plans through. In the end, all things come together in this story with a drive to do something right in the midst of all the fear and chaos being wrought. Which brings me to a part of the story which I am now kind of mixed on, meaning it was something I didn’t like about the story until after I realized the significance. The character of H, who appears on Yellowstone and provides some serious motivation to the plot. Initially, I had no idea who he was and saw his introduction as a total contrivance to the story. Not only did he know too much and have all the answers, he seemed to come out of nowhere. As plot twists go, this seemed like just another unnecessary one. However, it was in reading Chasm City, a prequel to which was released between books one and two, that I realized who he was. Sky Haussmann, who is an important background character, was detailed in that novel and wound up on Yellowstone becoming an influential figure. It was he who killed the Mademoiselle and ended up inheriting her secrets and her empire, thereafter becoming known only as “H” to hide his identity. And it was fitting, since he too wanted redemption and found it by helping Clavain and his friends, and even attempted to commit suicide himself when it was all done. Ah, which brings me to the weakness of this book, which bear some resemblance to all of Reynold’s other works. Once again, there are the excessive plot twists that just seem to keep coming and seem unnecessary. After all that is revealed in the early chapters, the book seemed perfectly packed with enough plot twists and revelations to keep the reader interested. However, in the later chapters, there are more which just seem to convolute things. For instance, Bax learns that her ship, Storm Bird, contains the AI of a man who was her father’s friend, and also a infamous because of an accident which apparently claimed his life. Facing death, and hoping to find a dignified end for his friend, he programmed the ship with his beta-level simulation to look after her. A nice story, a touching one even, but including it at that point in the story seemed too much and happened too late in the story. Another is Exordium. While it was a very interesting concept and did provide some synthesis and some added background to the story, it was yet another 11th hour revelation that felt unnecessary. It was enough to know that Galiana had come back from deep space with a warning ten years previous, they really didn’t need to know about this generations back. That discovery alone would have been enough to motivate the creation of the secret fleet, the cache weapons and all the rest. And if time frames were an issue, Reynolds could have just made it happen sooner. Last, but certainly not least, was the twist where it is revealed that the Night Council is in fact the Mademoiselle. What purpose did this twist serve, other than to involve the Mademoiselle from the first story? In that book, her agenda was clear. She was a Demarchist of great wealth and power who wanted Sylveste dead because of what he did to her. But now, what motivation did she have for infiltrating the Conjoiners or possessing the inertia suppressing technology? And, more importantly, what’s her agenda vis a vis the Inhibitors? Learning about them is understandable, but the agenda involving escaping into deep space and all, how’s that serve her interests? If anything, she would be trying to get her to help protect Yellowstone, where she presumably still is, not abandon it. Really, it would have been much more plausible to actually have had a Night Council and have them being the motivating force behind Skade’s actions regarding the Inhibitors. It would have been a plausible angle involving covert conspiracies versus democratic considerations, like how the tiny executive council wants to save the Conjoiners and is keeping it a secret because they know the Council will object to such a selfish, Darwinian plan. These same people could become a problem later after Clavain and his friends defected, even coming after them later. But like I said, this book was a worthy read, even more so than the first. It’s hard sci-fi and classic elements, and consistent themes of ancient aliens and worthy deeds in the face of impending doom – these all added up to a good story. And of course, Reynold’s usual stylistic touch, involving lots of cool technology, rich worlds, and his gothic, cyberpunk feel. It’s just cool! In keeping with why I picked it up in the first place, I highly recommend this book for those looking to learn more about current science fiction trends and what makes them popular. Lighthuggers, Inhibitors, Ultras, Hyperpigs, Conjoiners Drives, Demarchists, Chasm City… Few science fiction authors have come up with as many weird and intriguing concepts as Alastair Reynolds. 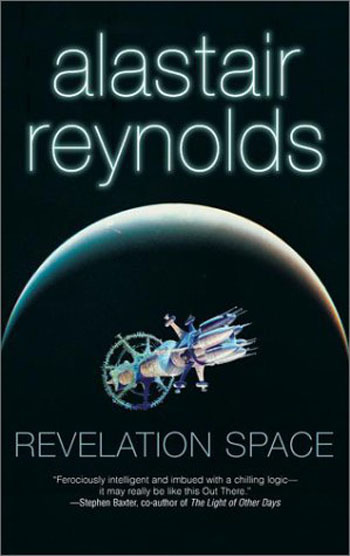 The author of the Revelation Space series, Pushing Ice, Blue Remembered Earth, Century Rain, House of Suns, Terminal World, and a slew of short stories and articles, Reynolds is not only a hard science fiction author but an actual scientist. Yes, from 1991 to 2004, Reynolds worked as an astronomer for the European Space Research and Technology Center, which is part of the European Space Agency, in Noordwijk, Holland. So when it comes to matters of science and space – be it exploration, travel, or the physics thereof – this guy really knows what he’s talking about. The story opens with three separate but interrelated strands, though their connection is initially unclear. The first takes place on a planet known as Resurgam in 2551, where an archaeologist named Dr. Dan Sylveste is leading an expedition to uncover the remains of the Amarantin. This alien species, which were a winged-humoid race, existed for over 900,000 years on the planet before some cataclysmic event wiped them out. The most recent discovery of the excavation team proves that the Amarantin were far more technologically developed than previously thought. Retiring to his den, Dan begins to commune with the beta-level simulation of his deceased father, Calvin Sylveste. Often, he consults his father, who died on Yellowstone, for advice in matters scientific and political. However, Dan soon learns that coup has taken place due to his obsession with uncovering the Amarantin, and a party shows up at the site to arrest him. Cut to 2540 aboard the Nostalgia for Infinity, a “Lighthugger” vessel that is the mainstay of the universe in this time (the name refers to the fact that it can fly to within an inch of the speed of light.) Here,Triumvir Ilia Volyova is awake while the other crew members are in reefersleep (cryogenic suspension). 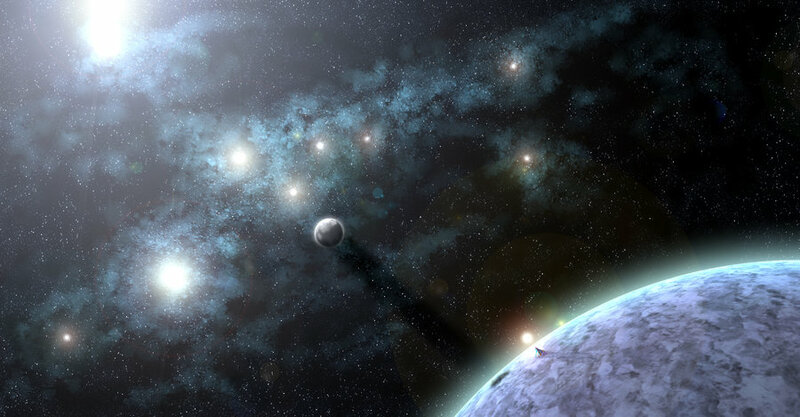 They are en route to the Epsilon Eridani system and the planet of Yellowstone to find Dan Sylveste, not knowing that he departed for Resurgam some 15 years previously. Its crew of Ultras (modified spacers) is desperate to find Sylveste since their Captain is a victim of the Melding Plague – a nanovirus that has infected all of Yellowstone. Basically, they are seeking his services yet again since his last treatment did not seem to take. Ilia also plans to pick up a new gunner since their last one apparently went insane and had to be spaced, the only clue he left behind was the name “Sun Stealer”, which he wrote on a wall in his own blood. Last, the scene switches to 2524 and the surface of Yellowstone, where professional assassin Ana Khouri is hired by a wealthy recluse known as The Mademoiselle. Apparently, she wants Dan Sylveste found and killed, and she knows the Nostalgia for Infinity will go to the ends of the universe to find him. As such, she orders Khouri to go into stasis and meet up with the crew 20 years later when they arrive in orbit. Meanwhile, we learn a few things of importance. For one, the Nostalgia appears to have been infected by virus other than the one that’s got their Captain in cryo-sleep. This virus appears to be what drove the last gunner insane and is threatening to kill Ilia now. During a training exercise where they test their landing suits, another glitch results in the death of another crewman, leaving only the Triumvirs – Ilia, Hegazi, Sajake – and the Captain. We also learn that the cargo hold of the ship is holding a large supply of Cache Weapons, what are apparently referred to as Hell-class, all of which appear to be a bunch of Doomsday devices. Ilia secured these weapons from sources unknown, but in time it is suggested that they are of Conjoiner manufacture – the same advanced faction that built the Nostalgia’s engines (aka. Conjoiner Drives). And finally, we learn why Sylveste is on Resurgam and why the Mademoiselle wants him dead. As it turns out, the Sylveste family maintained a research institute on Yellowstone dedicated to the study of alien civilizations. Many extinct cultures were discovered by humanity as it spread into space, no living ones aside from two exceptions. The first were the Pattern Jugglers, a planet-wide sentient species that comprised massive kelp nets that seemed to preserve the neural patterns of anyone who walked into them. The second were known as the Shrouders, aliens that were presumed to exist within a bunch of anomalous space-time bubbles. Sylveste became interested in these when a colleague of his became the first to survive contact with a “Shroud” but was left insane. After years of doing nothing but scrawl images on the floor, he spoke and told Sylveste that he actually made contact with an alien intelligence inside the Shroud. This area of space-time, he said, was known as “Revelation Space”. He told him further that they held information about a great mystery that would explain the deaths of all alien civilizations in the quadrant, and that he had to go to the Jugglers to get it. As preservers of memories, they held the secrets of many dead alien worlds in their massive neural nets. Having completed all this, Sylveste finally flew into the Shroud and survived. However, his partner in the expedition, a female researcher, was lost and presumed dead. In truth, she survived, but just barely, and returned to Yellowstone where she became a recluse known as… wait for it… the Mademoiselle! Hence why she wants Sylveste dead, because she blames him for her accident and the fact that she is now forced to live in a containment apparatus. Ah but there’s more! After he made contact with “Revelation Space”, Sylveste was told to go to Resurgam where he would find his answers. He did not know why, but it seemed the Amarantin were the final piece of the puzzle. Before that happened though, he was brought aboard the Nostalgia to help the Captain for the first time. And years later, his work would be interrupted when the colony rose up against him. Hints are also given as to what is going on vis a vis the extinction and the virus aboard the Nostalgia. Essentially, eons and eons ago, the first intelligent races of the Galaxy met up and began a prolonged conflict known as the Dawn War. After millions of years of fighting, the remaining civilizations, exhausted and cynical about sentient life, combined their intelligences with machinery to create a series of specialized weapons. Collectively, they came to be known as the Inhibitors, a race of machine-like intelligences that sought out sentient life and exterminated it once it achieved a high level of technical development. Meanwhile, on Resurgam, Sylveste is given a reprieve from house arrest to see the latest results of the excavation, which have proceeded in his absence. It seems that the crews turned up a massive underground city containing many ruins, and hints as to what happened. Featured over and over are an Amarantin idol which is reaching towards the sun. Hints are also given that Resurgam’s moon, Cerberus, was also particularly significant to the Amarantin people. After learning of all this, Sylveste proposes marriage to his new sweatheart and they prepare to have their marriage in the city ruins. By 2566, Khouri is brought aboard as the ships new gunner and they arrive at Resurgam. 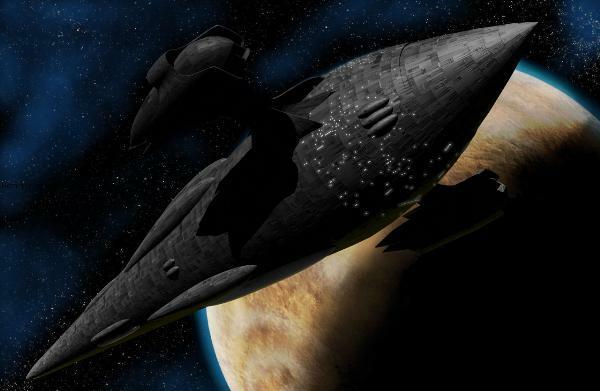 However, before they make orbit, a nearly catastrophic situation occurs when one of the ship’s doomsday weapons suddenly becomes active and has to be released. It detonates off their bow and creates an artificial singularity which very nearly consumes their ship. Having just made it away, Ilia concludes that the virus is stepping up its game! Once they make orbit, the crew establishes contact and demands Sylveste be turned over. To make their point, they stage a ruse where they pretend to level an outlying settlement, and the colony responds by handing Sylveste over. This they do by attacking him during his wedding and taking him and his wife prisoner. The crew fly down in their special suits to retrieve him and announce that they plan to bring him and his wife aboard. However, Sylveste turns the tables by saying his artificial eyes contain a pinhead antimatter device that will destroy their ship. He lists new terms, which include letting his wife go and taking him to Resurgam’s moon of Cerberus. In exchange, he promises to help their Captain any way he can. As Sylveste and the crew of the Nostalgia for Infinity approach Cerberus, Sylveste realizes the massive celestial body isn’t a planet at all—but rather, a massive space station. They fly inside and begin to be set upon by the devices defenses, but eventually make it down inside. Once in there, Sylveste realizes what it really is. Basically, the moon was built eons ago by the Inhibitors which served as a beacon to alert them of the emergence of a star faring intelligence. Once activated, it would signal the Inhibitors to launch their machines to the system so they could exterminate whichever species found them. Sylveste concludes that this is what happened to the Amarantin. Aboard the Nostalgia, Ilia also is confronted by the truth when the virus threatens to finally take over the ship. Appearing on the ships main display, an Amarantin who identifies himself as “Sun Stealer” explains their purpose to her. Apparently, the Amarantin are the Shrouders! These bubbles in space time have been their protection against the Inhibitors for hundreds of thousands of years, and their means of drawing out new sentient races to find them and do their bidding. When Sylveste’s colleague passed into them, they realized their time had come, and as such, tried to manipulate him into discovering if the Inhibitors were still alive out there. Unfortunately, this case of first contact went poorly. Not being able to recognize his neural patterns, the Amarantin nearly drove Sylveste’s friend completely mad with their message. Luckily for them, he was able to make sense of it in time and delivered it to Sylveste, who then came back to the Shroud where they were able to imprint a series of clues in his mind as well as a virus that would monitor him. These, they hoped would eventually lead him back to their homeworld and the moon of Cerebrus. Their intent all along was to have someone else make contact with the Inhibitor machine, thus they could see if it was safe to emerge from hiding. If so, they planned to retake their homeworld. If not, it would be a different race who was exterminated and they would wait until the next came along. However, that plan changed when Sylveste came aboard the Nostalgia for the first time and unknowingly planted the virus in the ship’s hardware. Hence why the gunner went mad and why its been threatening to take over the ship. Cut off from Sylveste, it was beginning to go mad. However, once he was aboard, it saw an opportunity to complete its mission. Having taken the helm, Sun Stealer now kept the ship in orbit around the moon and began reporting everything it saw back to the Amarantin Shroud. Down on the station, Sylveste realizes that the beacon has become active and that he has been played. Rather than allow the Inhibitors to emerge, he detonates the bombs in his eyes to destroy the facility. Back on the ship, Ilia decides to unleash the Melding Plague that’s been consuming their Captain and let Sun Stealer do battle with it. Sun Stealer loses and the ship begins transforming into a gothic nightmarish version of itself. But at least they’ve restored control of it to themselves. The story ends with the crew reuniting and setting course for Resurgam again. Well, I don’t know if you could tell from my description, but the plot of this book was pretty damn complicated and mighty layered. And personally, I thought that was a good thing! It is not unusual for an author to have distinct points of view in a story that seem unrelated but inevitably come together, but Reynolds was really working overtime with this one. How and where the plots overlapped could produce headaches due to the sheer effort of keeping track of it all, but I for one felt it worked pretty well. In addition, the inventions and futuristic concepts were a real mind-blower for me at the time. In fact, I specifically picked up this book in order to research modern sci-fi and get a dose of the latest hard science, and that’s exactly what I got. Beta-level simulations, Alpha constructs, nanotechnology, servitors, Lighthuggers, inertia, controlled singularities, and the like. It all called to mind numerous other classic sci-fi franchises, many of which Reynolds himself acknowledged a debt to. For example, his Inhibitors sounded very much like the Firstborn of the Space Odyssey series. Here and there, you had aliens who were so advanced that they could download their consciousness into machinery that would preserve them for eternity, making for effective space travel in a universe that didn’t permit FTL. Reefersleep also called to mind cryogenic pods from Alien and other franchises. Cybernetic implants, augmentation and nanobots are all concepts one can find elsewhere too. Still, the way Reynolds combined these things together was quite masterful, and very much in keeping with the tradition of space opera. And finally, I found the story downright intriguing. The concept of an ancient race that prevents the rise of space-faring sentient life because it knows from experience that such life will likely engage in prolonged war with other sentients seemed quite believable. One need only look at the process of human history to know that conflict is a defining feature, and that peace on a grand scale only seems to follow in the wake of terrible, exhausting wars. Consider Europe after two world wars, Japan after the Shogunate wars, or China after its Warring States period (and even after that!) Like it or not, peace and consensus are very often the result of war, war, and more war. Okay, now for the weak stuff. As I said already, the plot can be convoluted. For the most part, this works in the story’s favor. However, something which comes up in other Reynold’s works as well, is his tendency to throw in too many plot twists, especially towards the end. Already we have a very complicated and layered story which really didn’t need any more curve balls, but some are thrown even as the other plot threads are culminating. In this story, the unnecessary twists involve last-minute revelations. In Sylveste’s case, this happens just before he is captured by his own people and he takes the opportunity to unburden himself to his wife. He tells her that his father once had an alpha-level simulation of himself, as opposed to the beta that he frequently talks to. He gave this alpha to the Pattern Jugglers in exchange for the info they gave him. It is also revealed that Dan Sylveste is in fact a clone of his father. Hence his vanity and obsessive nature, they were retained from a father who wanted a duplicate of himself. Last, there’s the revelation that the Captain of Nostalgia – John Brannigan – went into the Jugglers sea himself and used them to imprint his mind on Sajaki, one of the Triumvirs. His reasons had to do with the fact that he knew he needed to go into reefersleep until they found a cure for the Melding Plague. Unable to stand the idea of being out of it for so long, he decided to get the Jugglers to erase Sajaki’s mind and replace it with a copy of his own, that way he could be aware of everything that was going on while he was under. This twist seemed quite unnecessary too, as it really didn’t advance the plot any, just added another complication. But overall, I was very pleased with this book and was sure to pick up its sequel. 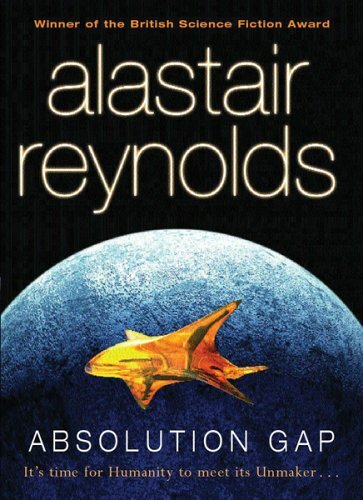 In fact, Revelation Space was the second Reynold’s book I had read at this point (the first was Century Rain) and I consider his writing to be a highly educational experience. In fact, much of his ideas and hard scientific basis served to inspire my own writing, particularly when it came to Source. So when it comes to authors I owe a debt to, he’s right up there! Stay tuned for more reviews of Reynolds and the Revelation Space Universe!